Ruffles, flounces and frills are one of the same. Worn well and you will mesmerise, opt for too many at once and your look could turn 80s fancy dress. 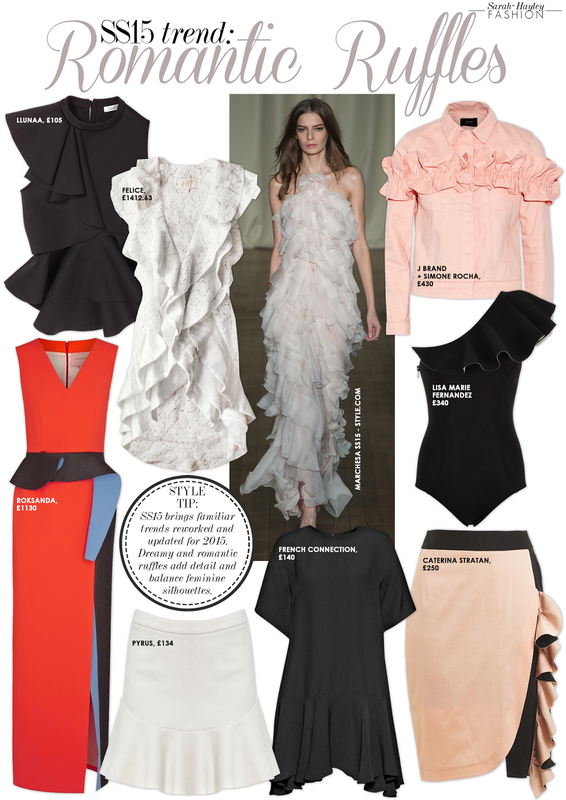 Sweeping across all aspects of fashion from daywear and eveningwear to nightwear and swimwear, ruffles are the epitome of femininity. For SS15 the trend features various forms, from exaggerating shapes on a column dress or pencil skirt to create definition, added to a hem to soften the silhouette, appliqued for a 3D look or layered and asymmetric to suggest a sculpted form. Whatever you choose remember this trend is all about movement.